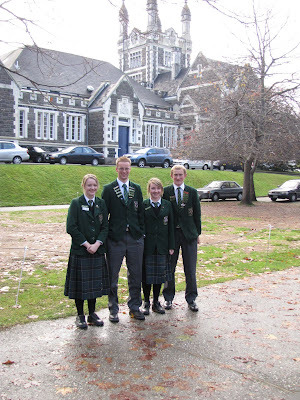 On Saturday the College debating team competed in the Russell McVeagh competition, held at Otago Boys' High School in Dunedin. The team was placed 6th out of the 14 entered. Congratulations to Patrick Stone ans Olivia King both received best speaker citations in the first and fourth debate. The debating team of Tim Lindsay, Patrick Stone and Olivia King are pictured competing against St Kevin's College. Below the team which includes Greta Melvin are pictured in front of Otago Boys' High School.